The immune system in adipose tissue is largely under-appreciated, yet adipose tissue contains an incredibly unique and substantial immune system. Adipose tissue covers much of the body, and can account for 50% of body mass in obesity. Each adipose depot in humans and mice has its own substantial immune system with collectively more lymphocytes than the liver. More surprising is that adipose lymphocytes have unique subsets and functions compared to their counterparts elsewhere in the body. A major component of the adipose immune system is non-MHC restricted ‘unconventional’ T cells which are often less diverse cells including iNKT cells, gd T cells, MAIT cells. We work on understanding the physiological basis for this enrichment of innate and ‘unconventional’ lymphocytes in humans and mice. Our goal is to understand this aspect of immunity, what regulates it, and the full potential it holds. 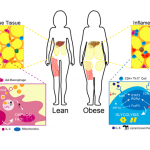 In lean adipose tissue, immune cells and neighboring adipocytes interact to regulate adipocyte lipid handling and insulin sensitivity, and prevent inflammation. IL-10 production by iNKT, Tregs and M2 macrophages and IL-4 production by eosinophils are important for this homeostasis. 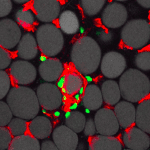 During adipose expansion in obesity, there is a loss of iNKT cells and Tregs, and a phenotypic switch in macrophages from M2 to M1, accumulating around hypertrophic rupturing adipocytes.